When I met Jason Edwards, I didn't stand up. So he got down on one knee, leveling the playing field...something he does well. I was wanting baby blue hair and he wouldn't do it. I booked an appointment anyway. Just by chance, a couple years later I found out his father owned the salon...a salon (and a stylist) that everyone in Los Angeles has heard of. Jason is not your typical LA hairstylist. He's not your typical guy. He's the only person I know whose tattoos don't look contrived. We got to play a little 20 questions, just before his 30th birthday. HYENA: How do you define style? JASON: Style...reflects how you're feeling, your attitude, your flow. HYENA: Will you override a client's bad idea? JASON: I will definitely override a client's bad idea if the balance is wrong. You just know if it's wrong or right as a whole. HYENA: Have you ever created what you believe to be a brand new hairstyle? JASON: I believe I've created different details within a haircut and color. HYENA: Tell me about your most unhappy customer. 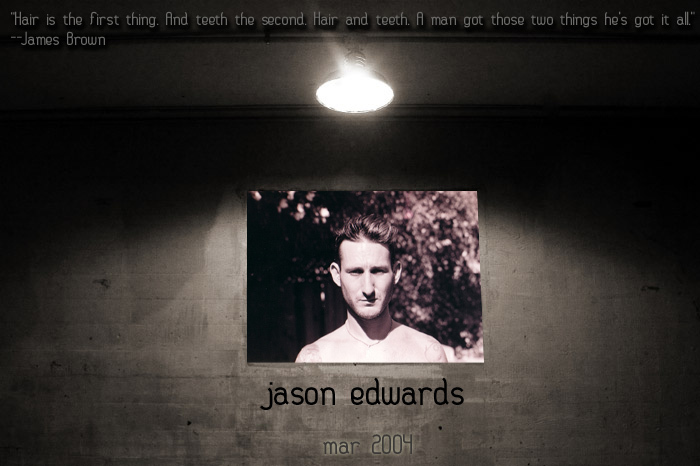 JASON: My most unhappy customer is the one who can never find much right in life. HYENA: When you're not working, say you're in a grocery store or skiing…are you aware of people's hair? JASON: Sometimes, if I'm looking at someone I'm looking at their whole style...hair, clothes, etc. HYENA: What is the biggest mistake people make regarding their hair? JASON: Worrying about it too much. HYENA: What is the most ridiculous fad you've seen in Hollywood? JASON: The mullet. And I have one. HYENA: You work closely with your family -- Allen Edwards Salon is you, your dad and your sister. A lot of families wouldn't want to spend their days together. JASON: All three of us get along really well. We all generally like the same kind of work so we can feed off one another. I really like working along side my family. but we do have our days like any other family. HYENA: Your father is a celebrity in his own right here in Los Angeles, having been the stylist for some pretty well-known hair. Do you stand in someone else's shadow or in their light? JASON: Nobody really stands in someone else's light or shadow. It's just an art form and we all learn from each other. HYENA: Will you one day have your own salon, do you think? JASON: I'm really focused on my clientele, and my craft. I'm traveling, a constant education... so owning a salon will have to come later. HYENA: Is the salon business like the restaurant business -- are you all in your own little universe? JASON: I'm in my own world when I'm doing hair. I'm not much of a talker when I'm cutting. I'm just in my work and being creative. HYENA: This salon has seen its share of celebrities. JASON: Celebrities and regular clients are all about the same. They all want to look and feel good about themselves. HYENA: If a client becomes a celebrity… does their hair change? JASON: The only thing that changes when a normal client becomes a celeb is they don't get to decide what they get any more. The studios do. HYENA: If not a hairdresser, what would you be. HYENA: You grew up in Los Angeles. How do you think that might've been different from growing up in other more "regular" cities? JASON: I'm glad I was born and raised here. It's made me well-rounded and cultured. LA is the best place to live. We have the mountains, lakes, ocean, desert...we have it all. I love Hollywood. It's got its own culture. You can choose to embrace it or ignore it. HYENA: Then you went to Israel for a year and a half. JASON: My parents sent me to Israel because I was a miserable student. So I got the school of life. HYENA: What is changing in you? What do you like most about who you are becoming? HYENA: What do you think of toupees? JASON: Toupees.................I have one (laughing). Toupee's bad!!! Clippers good!!! HYENA: Who cuts your hair? JASON: I have a few friends I like. So whoever's available. Jason can be found at the Studio City Salon. Appointments call 818 763 4005. "From Charlie's Angels to Ally McBeal, hairstylist Allen Edwards has been responsible for some of television's most memorable coifs. For the past couple of decades, his deft way with shears has kept his team on the cutting edge, whether it be tending to style-setters such as Jenna Elfman and Renee Zellweger or transforming Marcia Clark from serious prosecutor to glam pundit. 'To me, cutting hair is like buying clothes -- you don't walk into a clothing store and ask for something from 10 years ago,' says Edwards, who preaches that a hairstyle is a person's most important accessory. His hot streak began more that 20 years ago when he crafted Farrah Fawcett's feathered look ('People were lining up down the street' for that signature seventies do, he recalls). Today his clients include Chicago Hope's Christine Lahti and actress Julianne Moore."